Writing code is awesome. Have you ever compared coding works to the work of the potter ? He starts with a piece of clay, shapes it , refines it up to the final object. None from its production is fully identical to an other. Same thoughts apply to the coding works: the language is potter’s wheel, the bits, instructions, functions are the clay and the application is a plate, a jug, a vase. And we all know that we have our tricks, our fads, so that none from my code compares exactly to my colleagues. As far as creativity is concerned, every thing is fine . However, the side effect of this statement relates to the documentation. As my own thoughts change along the time, my coding skills evolved too probably so that I am now confused when I get back to dated code which lacks critical documentation. I can remember very well a pretty tricky coding section that I worked on 8 years ago, that was so trivial to me at this time so that I did not document it exhaustively (apart from the basic standard line commenting). It took me an hour or two to reverse engineering this code up to the ascertainment that this was just a nice trick and not so much rocket science, however tricky enough to require some more comments. Now that I handle x00.000 lines of code (actually 800 Mb of VB.NET code and 400 Mb of c/c++ code), documentation becomes quite critical. I paid a particular attention to my c/c++ libraries which are the fundamental basis for most of my applications and I decided to put some efforts on documenting my code, and improving the global description of the code in order to ease the use of these libraries and their inclusion in application code. I searched the net, asked my colleagues about the de facto standard application for documenting c/c++ code and looked at what others did when writing code. In the end, Doxygen appeared to be the application I was looking for. The quite nice thing about Doxygen is its ability to run apart from the code (as long as you pass the proper parameters); most IDE’s feature optional plugins including Doxygen plugins, more or less sophisticated which help a lot in documenting the code, extracting the information and building the documentation files (html, chm and latex actually). The rules are quite easy to understand, quite flexible, and once again, you can write your comments and documentation blocks the way you like. Posted on 03 Jan 2019, 19:35, by Didier, under Information. For the first time since 1993, we welcomed the whole family at home ! Including my dear Mom, 87 years old, a tonic Grandma, now a Grand-Grandma for the third time who agreed to travel with the tribe for this event. She paid a visit to my secret lab and asked many many questions and had a look at all these couloured bits and pieces pell-mell on my desk that she found “pretty”. I hope you had a pleasant Chrismast time too, and I send my best wishes to you all. The heating plate is made of two symmetric printed conductive layers ~1.5 Ohm each. As printed on the heating plate you may wire them for use with 12 V or 24 V power supplies. As we need to add an extra power supply the choice for a 24 V power supply is trivial as less current will flow through the switch and the wires. As the minimum power rating for the power supply is 192 W, a 200 W power supply (and above) will do the job without efforts. Nota: When choosing the power supply, check for the thickness. Many power supplies are 50 mm high which will prevent a proper cooling because of the insufficient air gap below the power supply. For a few euros I went for an off the shelf power switch. I found no reason why I should spend time to built a more expensive one. This switch is driven from the heat bed output of the Marlin board. The switching part is fully isolated with an optocoupler. The marked wire is the goes to the + terminal on the main board. Best is to use MTA-100 series connectors (1 x 2 pins and 1 x 4pins). However if you do not not have such connectors you may use headers as the pins spacing is 2.54 mm. Nota: the wire gauge is so high (in other words, the wires are so thin) that I failed to crimp the wires in the connector so that I add to solder the wires in order to achieve a reliable connection. Next pictures illustrate the configuration that I choose for installing the power supply and the switch. The idea was to keep the wires as short as possible and to leave the aperture unmasked as I find it very convenient for cleaning the cabinet. Before running any print, you need to update the slicer parameters. This start G-Code feature a short print which allows a proper priming of the extruder, a nozzle cleaning and a simple printing quality check. And here we are at last ! Posted on 09 Dec 2018, 23:38, by Didier, under 3D printing. Except these minor problems, I have no particular complain and lots of enjoyment with this printer. Although PLA is very, very easy to print in most cases, it lacks to mechanical properties of ABS… And printing ABS on a non-heating bed is almost impossible. As I had to print a small ABS part in a hurry, I used an air dryer flushing hot air beneath the printing bed but this was some sort of desperate option although it proved to work fine. Months ago I ordered a heating plate and a spare DC power supply but I failed to find time to install the option and had no more particular reason to do it. Under the pressure of some Christmas presents that require some printed parts, I proceeded with the modification that I will now describe. Removing the printing bed is plain easy. Some drilling in the metal plate is necessary and a drill press might be very useful for achieving a clean result. Draw carefully the center of the drilling locations (3.5 mm) using the heated plate as a template. Also, use a special conical cutting tool for removing enough metal from the heated bed so that the heads from the flat screws (M3x15) do not exceeds the surface (opposite to the heating layer). Cut the original support plate to leave space for the electrical connections. Cut the insulation rock wool sheet with a simple cutter. Solder the 100 kOhm thermistor on the heater plate so that the little bulb sits in the dedicated hole. Put some thermal compound in this hole in order to improve the thermal joint. Take special care to the connecting wires: they must not touch each other and must not touch the metal plate either. Assemble the parts; use tooth lock washers and gently tighten the nuts. Solder the wires on the plate after checking the required configuration depending on the power supply used (12 or 24 V) and reinstall the whole assembly. Next is an illustration of the retaining springs that I used in the past: I reused the design for making larger springs as the printing bed got thicker. Then you will need to move the Z axis stop sensor 8 mm downward. You have no other choice than to drill 2 new holes in the back panel of the printer. Adjust the stop position using the standard procedure. And here is the driver code. Nothing exceptional just plain good’ol arduino code. Check the writeByte function which contains few tricks and optimizations that are mandatory to achieve a proper timing. Ultimately this code contains a pretty versatile bit-bang UART writer that you may want to reuse in various applications. of bits and a false for an even number of bits. As per product reviews on the web and as per my personal experience, the DR-40 picks up noises generated by the handling of the device. 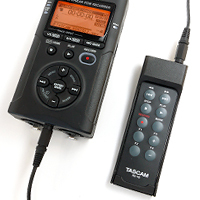 One way to prevent such noises consists in using a wired remote controller namely the Tascam RC-10. The key component from this option is a compact flat box featuring 10 buttons. 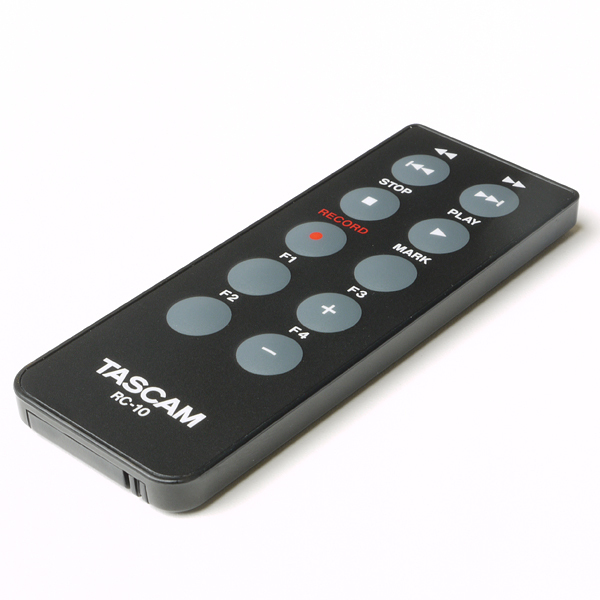 It outputs a coded IR beam for controlling TASCAM devices. However, as the DR-40 does not feature an IR receiver port so that TASCAM (actually TEAC) designed a dock for the remote controller. This dock is very likely fitted with an IR receiver which converts the coded IR beam into a TTL compatible signal. This TTL signal is routed to the DR-40 via a 3 wires cable which plugs to the bottom of the recorder with a 2.5 stereo jack. The dock itself features a clip at the back which is handy for attaching it to your belt of your trousers or to the pocket of your reporter vest. Please note that unlike the DR-40 itself, running some functions require doubled actions: to stop a play back, run the stop command twice. The first one will pause the playback, the second one will stop it. To record sounds, run the record command twice: the first one presets the recording and the second one launches the recording itself. The pull up resistor which is built in the DR-40 is about 10 k Ohm. However it looks insufficient for obtaining clean squared pulses out of the interface. I experimentally found that fitting a 10 k Ohm resistor (R1) in the interface is a good compromise between signal cleanness and power consumption. R2 might be in the k Ohm range (1 to 10 k Ohm) and T1 might be any general purpose NPN transistor holding up to a vertiginous 10 mA Ice (A 2N3904 will do the job very well). R3 is chosen so that the current through the LED is about 10 mA which is the optimum running point for a 4N35 optocoupler (500 Ohm). From a code point of view, all you have to really care about is the inverted signal out of this controller: a high level on an Arduino pin will result in a low level on the controller side. The code that I will introduce in a later post features a bit bang serial writer that can be set for both normal and inverted signal (in other words, spaces and marks are swapped in the digital messages). Few other things have to be taken into account. Firstly, the baud rate is 9600. Issuing a key action consists in generating a key press word, wait for 150 ms and issue a key up word. I did not bother with the key down state as it makes no sense in the context of this project. Last but not least, the issued words are 11 bits long: 1 start bit, 8 data bits, 1 even parity bit (the number of marks + the parity bit must be an even number) and 1 stop bit. Again, the bit bang writer will allow you to set all these parameters. Posted on 27 Oct 2018, 23:52, by Didier, under Acoustics, Electronics, Information, Sound recorder. 1 small rubber stand in a small plastic bag! Watch out, this small rubber stand is a very convenient part that I nearly missed and would have lost… you may want to store it in a safe place when not in use in the batteries compartment, as shown on a the picture below. Using the device is pretty intuitive. This buttons are smooth and comfortable to use, the screen is quite small (to my aging eyes) but still readable. However, as mentioned in many reports which to apply to most devices from any brand, there are many recording options which may not be so easy to find. One should have a good understanding of the recording parameters (Sampling rate, sound level management, band width limitations, resolution, etc.) before trying to use this device. Oh, well, selecting WAV format with 24 bits data sampled at 96k in automatic gain control mode will do the job in many cases. As long as you do not fear XXL data files and long lasting post-production data analysis. I was amazed by the microphone position sensor ! When you move both microphones, the menu asks for confirmation of the XY (Crossed) or AB (Split) mode ! Pretty convenient. The primary use of this recorder is the capture of out-door sounds so that I “invested” in a wind screen. I took no risk at trying cheap fancy looking fur caps and instead followed the recommendation of the supplier. So I ordered a RYCOTE DR-40MWJ which fits as expected very well to the recorder’s body, has plenty room for the microphones even in the AB position. On the other hand, the XLR extractors prevent the recorder from standing still in a vertical position. One may add a pair of rubber feet to compensate the offset. It does take a few minutes to get ready and record the first sounds. Data can be read from the SD card (micro SD sitting in a standard SD dock, well done TASCAM !) or by connecting the recorder to a PC via the USB mini cable. My favorite sound analysis software is Audacity, almost as powerful as Goldwave but free. Both software feature many, many functions which are very useful not to say mandatory to cleanup records, mix tracks, normalize, etc. Posted on 21 Oct 2018, 23:38, by Didier, under Acoustics, Hardware, Instrumentation, Sound recorder. Availability of compatible accessories: carrying case, wind shield, external microphones (Possibly XLR), etc. Casing: ranges from plastic to strong metallic casing. Cheap solutions may not be reliable and strong enough in the long term and generate noises when handled without extra care. Amplifying stages: ranges from basic designs to very carefully designed pre-amplifiers. This draws us back some decades ago and is still meaningful to me. Noise and dynamic range are directly affected by the design. Built in microphones: I am lacking consistent experience in this domain but my guess is that the primary source of information is critical and that a wide range a products exists. Power: This is an other not so critical but very practical aspect of the devices. One may decide from the very early development stages if the device shall be ULP, LP or simply as good as it can be. Anyone who missed this exceptional picture our sound capture because you were low on battery will understand me ! And ultimately, I had to take my budget into account ! Taking into consideration the fact that the recorder may (and will) require additional accessories in order to be used in various conditions, e.g. wind shield (1/4 of the price of the recorder! ), tripod, remote control, etc. I focused my interest in the products lying in the 100 to 200€ range. I read many posts in various websites, including this detailed, very well documented web site on capturing sounds from animals. Too bad, the price range of the recommended equipment was much, much higher than my top budget. However this blog was very instructive and informative so that I tried to take most of their argument into account and tried to apply them to my own project. Among the serious papers I found was this very informative review from Mike Rivers which was very helpful to me for making a thoughtful decision. Many other comparison can be sound including this one from the Cornell Lab of Ornithology. Allez, zou, pour une fois voici une publication en français ! Cà fait un moment que çà me grattouillait le clavier de composer dans ma langue maternelle, et je vois au moins deux bonnes raisons de faire une entorse à ma politique de publication. Soyons réalistes, l’anglais est une langue universellement comprise par les technophiles, et, persistant à vouloir partager avec le plus grand nombre, c’est la langue que j’ai choisie pour mes publications. Cependant, je suis très agacé par le récent raidissement de nos voisins anglo-saxons et leur repli économico-identitaire: non mesdames, non messieurs, vous n’êtes pas seuls au monde, vous ne détenez pas le monopole du savoir et de la science, ouvrez les yeux tant qu’il est encore temps. Ceci étant dit, cet article va traiter d’un sujet que seuls les mangeurs de grenouilles, porteurs de béret et accrédités à délivrer le French kiss (tiens, voilà t’y pas que je rechute) peuvent comprendre. Je vais vous parler d’une petite merveille qui a permis l’introduction des principes de l’informatique jusqu’au plus profond des campagnes et qui a été détrônée par la vague Internet au seuil du deuxième millénaire après 30 ans de bons et loyaux services. Je veux parler du Minitel bien entendu. 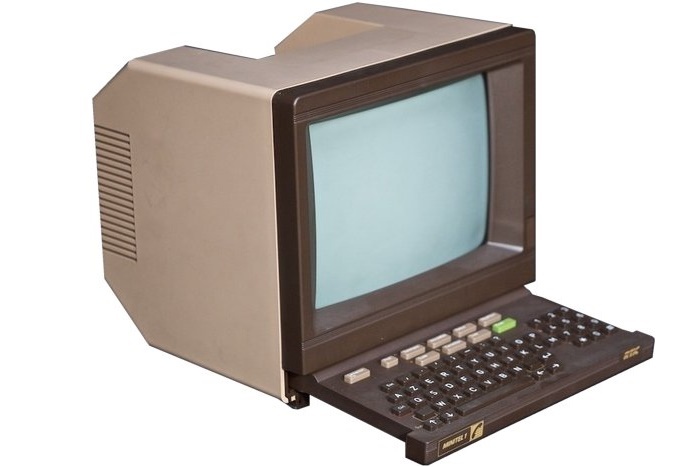 Lorsque le programme est lancé, le Minitel doit afficher afficher deux lignes d’entête et 32 lignes (paramètrable) de pseudo image mémoire sous forme de deux séries verticales comportant chacune une colonne d’adresses séquentielles (hexa) et de contenu mémoire (12 octets) constitué de caractères aléatoires n’appartenant pas à l’alphabet. Dans ce contenu mémoire sont mélangés aléatoirement six mots (paramètrable) de six lettres, dont un, tiré au hasard, est le mot de passe. Le joueur peut effectuer 4 tentatives (paramètrable) pour trouver le mot de passe. A chaque tentative invalide, le programme indique le nombre de lettres correspondantes entre le mot de passe saisi et le mot de passe tiré au hasard par le programme. En cas de succès, l’écran est effacé et remplacé par un message de succès suivi du code d’accès BLABLABLABLABLABLA*. Dans le cas contraire, un message d’échec est affiché. Dans tous les cas une ligne de saisie (précédée par le caractère >) est destinée à recevoir le code admin BLABLABLA* qui relance le jeu. * vous n’imaginez tout de même pas que je vais dévoiler les mots de passe! Le principal défi technique à relever est l’intégration de tout le code ainsi que la base de mots de 6 lettres, soit 7773 mots) dans une simple carte Arduino . Et pour corser le tout, le fab-lab disposait de 15 jours pour boucler le sujet ! Au départ, je me suis posé la question de développer un algorithme de compression pour réduire la taille de la base, mais le temps faisant défaut, et surtout, souhaitant impliquer nos jeunes développeurs, j’ai bâti le projet sur des bases plus simples. Une option aurait pu consister à intégrer la base dans une carte SD, mais nous n’avions pas de shield sous la main. J’ai aussi fouillé sur la toile à la recherche de librairies de pilotage du Minitel, et, bingo, j’en ai trouvé plusieurs, plus ou moins à mon gout et surtout assez gourmandes en mémoire. Au final, j’ai opté pour un code maison, le plus compact possible, de manière à libérer un maximum d’espace mémoire (mémoire programmable) pour y loger les mots clé. J’ai écrit un petit algo très simple pour décimer les mots clés et conserver au final 3000 mots répartis de manière homogène dans l’alphabet. Partant de là, yapuka ! Je me suis aidé de la très complète documentation (56 Mo) “spécifications techniques d’utilisation du minitel 1B” ainsi que la consultation de nombreux sites Internet consacrés au Minitel. Code sur demande, comme d’habitude. Le hasard étant facétieux, que ne lis-je point dans ma veille techno sur Twitter ? Un article consacré au même sujet traité avec des solutions beaucoup moins attrayantes !